"Roadside naturally maintained Ecosystems" by the Reveg Edge and the Roadside Vegetation Analysis Program. ROADSIDE VEGETATION ANALYSIS PROGRAM. Analyzes the potentials for conversion fron exotic plant management to local ecosystem function re-establishment and low maintanence. 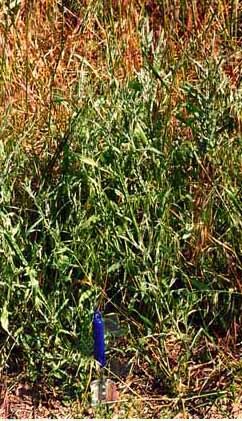 Yellow star thistle (left), and wild oat/ripgut annual grasses [Can you find the trowel?] (right). An alternative to the exotic grasses and weeds can still be found within the Interstate right-of-way, but it is easily overlooked because it is short, low-growing: THE ORIGINAL CALIFORNIA NATIVE PERENNIAL PRAIRIE! 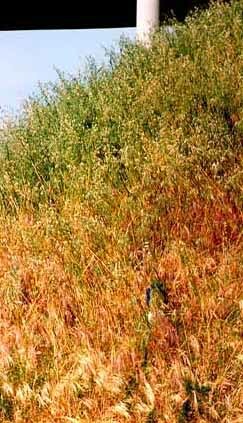 All around the United States, native grassland communities still exist in relict stands, and if studied and expanded, they could provide practically maintenance-free roadside groundcover. Our company analyzes where these relict natural ecosystems exist: we determines which species and ecotypes are most important for successful use along roadsides, and we analyze what is required to recreate a functioning ecosystem. Why fight nature...utilize it to maintain a low maintenance roadside landscape!